Qik the mobile video conferencing software company that was acquired by Skype in january 2011.Has today launched a new iPhone app called Qik Video Connect. 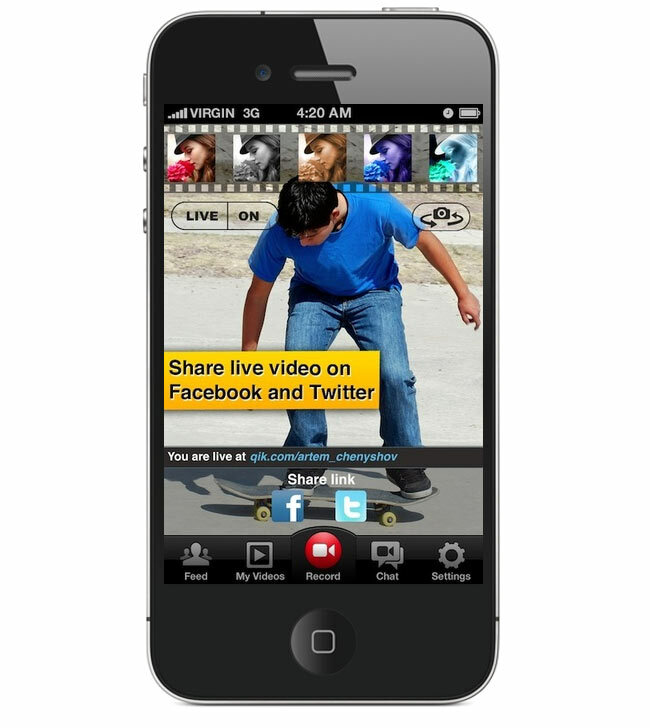 The new app has been designed to allow you to stream live video footage directly to your Qik.com user page. It also allows you to make live video calls over either 3G or Wi-Fi connections as well and if both those methods fail to get the footage to its desired target audience. You can always post a live video link to your Facebook and Twitter accounts to allow friends to watch the moment as it is being recorded or even use the mail feature to create a video and then email in the footage to them. **Update: The paid version will be available today – but the free version is still in approvals with Apple. The iPhone iPod app is available today in two version Qik Video Connect and Qik Video Connect Plus priced at $2.99. The Plus paid version offers a few extra special features including: Seven real-time custom effects and filters, video editing and HD quality capture and upload.